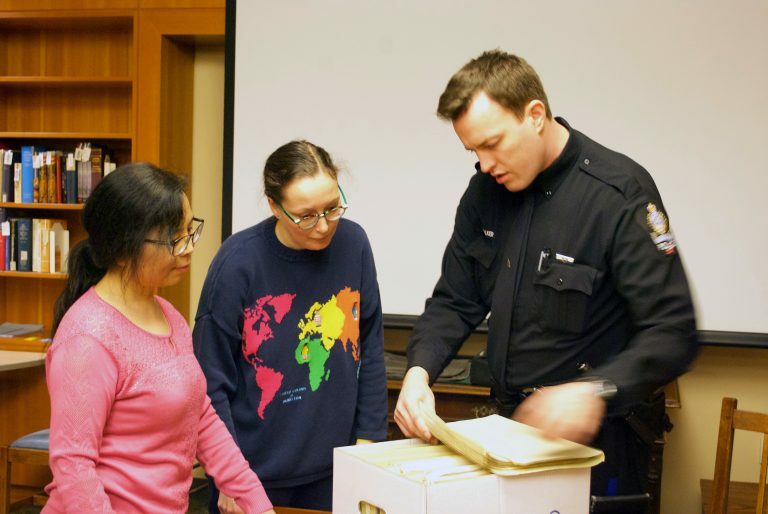 Special Collections help Vancouver Transit Police constable uncover 102-year-old murder. March 20th, 2017 by michelle blackwell | Comments Off on Special Collections help Vancouver Transit Police constable uncover 102-year-old murder. 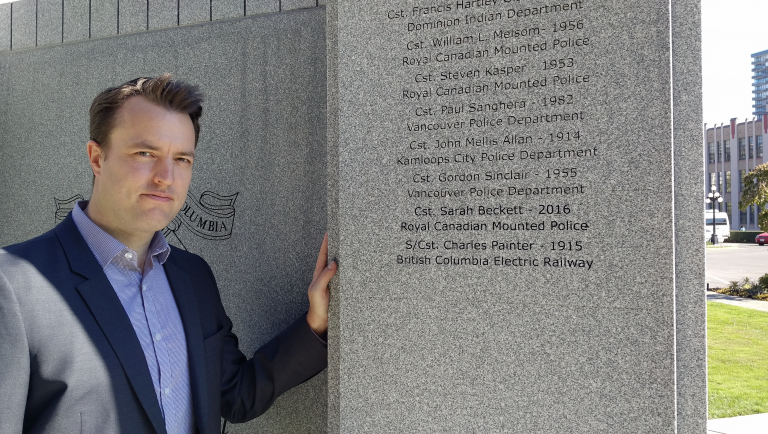 In 2015, Constable Graham Walker of the Metro Vancouver Transit Police was asked to research the force’s history for their 10-year anniversary. His research led him to the City of Vancouver Archives, BC Hydro Archives, the Vancouver Police Museum and to our very own UBC Library’s Rare Books & Special Collections where he discovered that the history of the Vancouver Transit Police in fact dates back more than 100 years – to 1904. In his digging, Walker uncovered something even more intriguing, the 102-year-old unsolved murder of Charles Painter, a special constable for the BC Electric Railway, in 1915. We spoke to Constable Walker about his incredible journey into the past and the research that has culminated in a provincial memorial for Charles Painter. How did you first learn about Charles Painter’s murder? I was part of the event planning team for Transit Police’s 10-year anniversary in December 2015, and I was curious about our origins previous to the BC Transit Special Constables who were first appointed in 1985. My research began at BC Hydro Library and Archives, then UBC Library’s Rare Books & Special Collections. Before long I had learned of a century-long history of railway constables, night watchmen, and security officers on transit in British Columbia. There was even an armed special constabulary which protected the transit and power systems during World War II. Continuing my research, I visited the Vancouver Police Museum. There, the curator was assisting me in reviewing their archives when she discovered Painter’s murder recorded in the Vancouver Police annual report from 1915. What made you want to learn more about his death? This was the first anyone had heard of a line-of-duty death in our organization’s history. I also knew that he was not listed on the provincial memorial for fallen officers. Recognizing him was important to me because I felt a personal connection – he did a similar job to mine and I was even the same age as him when he died. It was an especially tragic death because it was caused by another person, and not an accident. He never had a memorial, and wasn’t recognized – possibly because he had no known family at the time of his death. This was a wrong I knew I could correct by collecting the appropriate evidence for a proposal that he be added to the memorial. Tell us a little about Charles Painter, his job and how he died. Back in 1915, the streetcar system was operated by BC Electric Railway, a company which also operated power plants and sold electricity to cities and residents – that company became BC Hydro in 1962. They employed constables, appointed under the Railway Act, for special projects or events. In S/Cst. Painter’s case, during World War I he was assigned to the tracks along False Creek to guard against wire theft. It was 2 am on March 19th, 1915 when he spotted a man carrying a sack on his back near to the tracks. He called out to him and drew his revolver. In the resulting struggle, the gun went off and the suspect fled west along the tracks with Painter’s gun, handcuffs, and baton. He was taken to Vancouver General Hospital via the Police Ambulance, but succumbed to his injuries two days later. I focused on three things that were required for him to be honoured by the provincial memorial – that he was duly appointed to office, he was acting in good faith at the time of the incident, and his death was caused by an external influence. I first reached out to Vancouver PD to see if they had files on the investigation, but unfortunately, they didn’t. Local historians tell me that back then, detectives would routinely take files and exhibits home after the case was concluded. 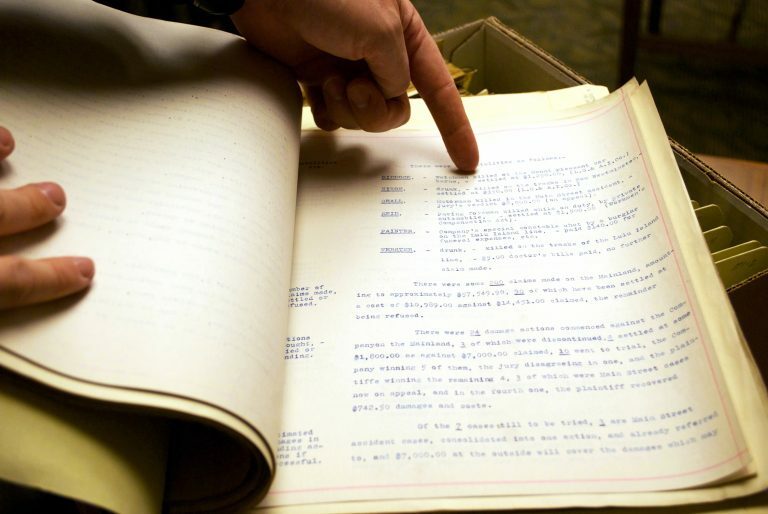 The provincial archives did have the coroner’s inquest on file, which was of great help. It included witness testimony from the man who found Painter wandering West 6th Avenue calling for help, and how he got him to the hospital. With the inquest file, the UBC Library Rare Books Special Collections records showing how constables were appointed, and copies of the Railway Act of 1911, I was able to put together a proposal. It included an endorsement from Chief LePard and an explanation of how Metro Vancouver Transit Police is a succeeding agency. It was accepted and his name was added to the memorial. Senior Library Assistant, Felicie de la Parra and Vivian Yan, Public Service Library Assistant work through the BC Electric fonds with Cst. Walker. Tell us about the sources that you found most helpful at UBC Library’s Rare Books and Special Collections that helped you with your search. I had to refer to the BC Electric fonds. While Painter’s death was one of the most important things I discovered, much what we know about transit policing in BC resides in the RBSC collection.Early records include letters of appointment for constables, lists of locations where they were deployed, and even reports on their activities. Later files include newspaper clippings of transit related crime including robberies and thefts. The most interesting files are from the years 1904 to 1918 and include the names of many of the people who were early protectors of the streetcar and transit system. My favourite item is one describing how a constable was suspected of taking a drink while on duty while posted to the terminal at 425 Carrall Street in 1909. The railway hired a private detective agency to pose as streetcar employees to monitor his activities. Their observations make for an interesting peek into the goings on at Hastings and Carrall during that time period. The constable was followed into the nearby hotel bars and was fired as a result. One of several reports Cst. Graham referred to in his research. 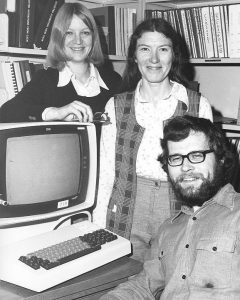 Who did you work with at Rare Books and Special Collections and can you tell us a little about how you worked together? It was by recommendation from the librarian at BC Hydro that I first reached out to RBSC. Through the UBC website I reached librarian Chelsea Shriver, who invited me to attend in person. I had never conducted archival research, so she had to show me the ropes – and was very helpful. I started by asking for a few boxes listed in the BC Electric collection. The library staff walked me through requesting material, and protocols around reproducing information and how to reference my sources. Even when I had questions about the origins of material or was looking for more, they knew right where to look. I’ve returned several times in the hopes of finding more, and I’m lured there still by the chance there are more amazing stories remaining hidden in those boxes. I was born and raised in the lower mainland to parents (and grandparents) who worked in the justice system. 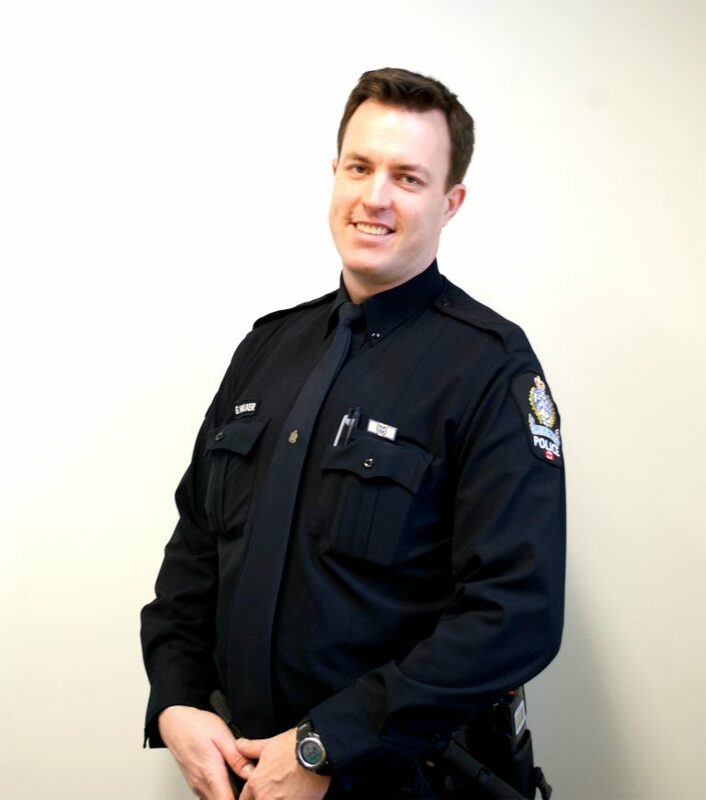 I was an officer with Correctional Service Canada before joining Transit Police, and I have specialized in public relations/communications in policing. A graduate of Thompson Rivers University, I have always had an interest in local history. This project has really piqued my interest though, as it combines my career with my hobby. It was really a pleasure to learn about things which were long forgotten. What’s next? Any new developments in the Charles Painter story? Well, S/Cst. Painter’s murder is still technically unsolved. While there was some evidence which surfaced in Steveston in late 1916, the prime suspect was never brought to trial and I’m still searching for a young soldier’s letter which implicated a man with pro-German sentiments as responsible for the murder. In the meantime, our employees have purchased Painter a gravestone which will be dedicated and consecrated at a ceremony on the 102nd anniversary of his death in March. Cst. Graham Walker at the Provincial Memorial for fallen officers where Cst. Charles Painter’s name has been added. A private gravestone dedication for Charles Painter will take place on March 21, 2017. Posted in BC Electric Fonds, carousel, community engagement, General, local history, Metro Vancouver Transit Police, Rare Books and Special Collections, special collections, Vancouver history | Comments Off on Special Collections help Vancouver Transit Police constable uncover 102-year-old murder.